Wayne W. Dyer, affectionately called the "father of motivation" by his fans, is one of the most widely read authors today in the field of self-development. He is the author of many books, including such bestsellers as Your Erroneous Zones (over 30 million sold), You'll See It When You Believe It, and Real Magic. 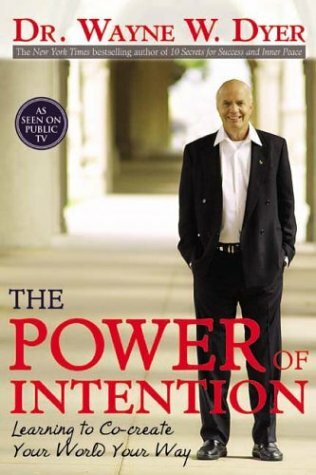 The Power of Intention: Learning to Co-Create Your World Your Way - Dr. Wayne Dyer - Dr. Wayne W. Dyer has researched intention as a force in the universe that allows the act of creation to take place. This book explores intention - not as something you do - but as an energy you're a part of. We're all intended here through the invisible power of intention. This is the first book to look at intention as a field of energy that you can access to begin co-creating your life with the power of intention. Audio Cassette. CD. Larry's Review: Dr. Dyer's newest book and one of his best! Your Erroneous Zones - Dr. Wayne Dyer - If you are plagued by guilt or worry and find yourself unwittingly falling into the same old self-destructive patterns, then you have "erroneous zones" -- whole facets of your approach to life that act as barriers to your success and happiness. Dr. Dyer teaches how to take charge of your emotions and control your worries. Pulling Your Own Strings: Dynamic Techniques for Dealing With Other People and Living Your Life As You Choose - Dr. Wayne Dyer - This directed and practical book shows how to stop being manipulated by others and start taking charge of your own life. Your Sacred Self: Making the Decision to Be Free - Dr. Wayne Dyer - In this liberating and enriching book, Dr. Wayne W. Dyer teaches us how to tap into the power of our higher selves and live each day, regardless of what we do, with a greater sense of peace and fulfillment. This book reveals a three-step program to help us understand our place in the world and develop a sense of satisfaction with ourselves and others. Step by step, we can change the way we experience life -- moving from our insatiable need for more, to an awareness of abundance; from a sense of ourselves as sinful and inferior, to an acceptance of ourselves as divine; from our hunger to achieve, to the detachment that brings true freedom. Real Magic: Creating Miracles in Everyday Life - Dr. Wayne Dyer - This book is the seemingly miraculous response of the environment to a unity of purpose and belief in the individual. Whatever you believe, you will create both within and outside yourself. Health, prosperity, a more pleasing and successful personality, fulfilling relationships -- all are within our power to bring into being. How? By becoming more spiritual beings; by being open to divine guidance; by meditating daily; by being willing to believe in a reality beyond that verifiable by the five senses; by developing a loving, accepting attitude. You'll See It When You Believe It - Dr. Wayne Dyer - Experience new plateaus of self-awareness. This book will show you how, by tapping the truly amazing power that lies within you, you can direct the course of your own destiny. Dr. Dyer will show you how to transform your life by using your thoughts constructively. Manifest Your Destiny: The Nine Spiritual Principles for Getting Everything You Want - Dr. Wayne Dyer - This book tells you how you can connect with your Higher Self though practicing the Nine Spiritual Principles outlined and explained in easy to understand and apply ways in each chapter. Wisdom of the Ages: 60 Days to Enlightenment - Dr. Wayne Dyer - Author Wayne Dyer offers wisdom taught by the world's "great teachers" (such as Buddha, Jesus, Confucius, Michelangelo, and Emily Dickinson) and then provides an easy-to-digest interpretation for modern readers. The book is formatted into daily, quoted passages (around a page in length) from 60 of these teachers - the "60 Days to Enlightenment" in the book's title. After each quote, Dyer offers his own thoughts on how the "lesson" can be applied to contemporary life. 10 Secrets for Success and Inner Peace - Dr. Wayne Dyer - A thought-provoking book for those of us who have chosen to consciously be on our life path. The ten "secrets" for success and inner peace presented here apply whether you're just embarking on your path, are nearing the end of it, or are on the path in any way. Dr. Dyer urges you to read these ten secrets with an open heart. Click here to contact Dr. Wayne Dyer.